For relaxing lake living without sacrificing the city, Lake Minnetonka is the place to be. Located less than an hour from the Twin Cities, Lake Minnetonka provides both visitors and homeowners the luxury of beautiful lake-life year round. Lake Minnetonka’s history began around 8,000 B.C. when melting ice formed the body of water covering approximately 14,500 acres. From then until around 1,500 C.E., inhabitants of the region constructed large land features, creating an ancient civilization—the first sign of the coveted lake-life that Lake Minnetonka would provide. Fast forward to the 1800s, Europeans make the discovery of the beautiful body of water official. Minnesota’s territorial governor, Alexander Ramsey goes on to name the lake, Lake Minnetonka, which can be roughly translated to a Dakota name meaning Big Water. In 1853, the first settlement is established, leading early pioneers to settle near the water in pursuit of natural resources such as lumber. Later in the 1800s, Lake Minnetonka becomes a popular place for tourists, offering famous hotels, steamboats and more to explore. With the expansion of the railroad, tourists start trying out new locations, seemingly leaving Lake Minnetonka behind. As Minneapolis and Saint Paul start to grow in 1906 and beyond, flour millers begin building vacation homes on the lake. Minnetonka continues to grow, even through rough times such as the Tornado Outbreak of 1965. Highways are built, subdivisions pop-up and Lake Minnetonka becomes the beautiful, easy-going and comfortable living area that it is today. Not only is Lake Minnetonka a great place to live, but it’s also a great place to play. Lake Minnetonka is surrounded by amazing cities including Mound, Wayzata, Excelsior, Orono, Shorewood and more. Each location offers many fun and exciting things to see and do. Experience everything the water has to offer: There are many ways to recreate in the lake such as renting a pontoon boat or taking a ride on a jet ski. If boating isn’t your style, you can visit Wayzata Beach, Lake Minnetonka Swimming Pond, The Commons Beach in Excelsior or various other public beaches. Eat your way around the lake: Enjoy fine dining at Lord Fletcher’s or grab brunch at Maynard’s. 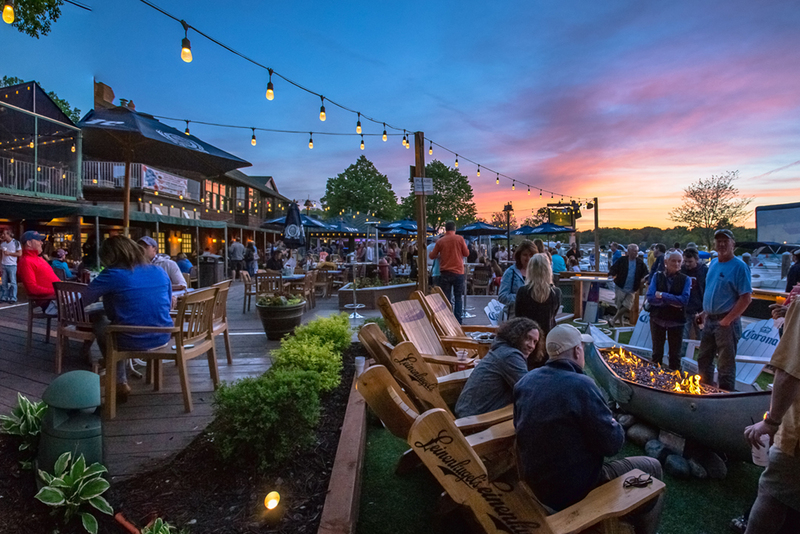 Lake Minnetonka is home to a wide range of restaurants and cuisine. There’s something for everyone here. Ride in a steamboat: You can enjoy a ride from Excelsior to Wayzata and back on the Steamboat Minnehaha, the last of many steamboats that were once found on Lake Minnetonka. Take a stroll through the garden: The Noerenberg Gardens feature a wide array of beautiful flowers and plants including a large daylily collection and huge wedding venue. Hop on the trolley: In Excelsior and Wayzata, you can ride in a trolley, a nostalgic experience for all ages. Take in a show: Around the lake, there are various playhouses and dinner theaters to enjoy including the Chanhassen Dinner Theater, The Old Log Theater, Plymouth Playhouse and more. Explore Big Island Nature Park: Once an amusement park, this island in the middle of Lake Minnetonka is now a thriving regional nature park featuring docks, trails and more. Lake Minnetonka is also home to various unique boutiques and shops throughout the lake towns. Whether you decide to visit the lake or make it your home, there’s always something to do right around the corner. Want to Know More About Lake Minnetonka? Are you considering making Lake Minnetonka the place you call home? Surrounded by beautiful landscape, tons of attractions and the luxury of living on the lake, Lake Minnetonka is the perfect place for your family. To learn more about the lake, give us a call at (952) 404-5004 or send us a message.